Ergonomic loop-handle needle nose pliers are an easier-to-grip redesign of the tried-and-true household tool. You can also opt for side cutter, lineman, and slip joint pliers that have all gotten the same makeover. 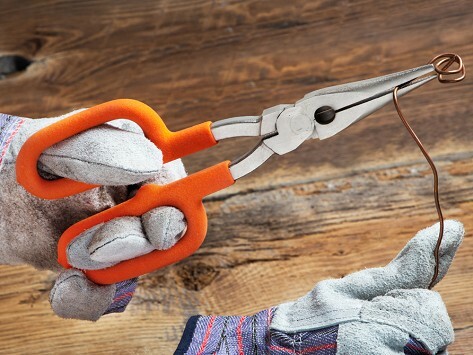 The loop handles give you better leverage and control of the pliers and feel good in your hand, especially if you if you have dexterity issues or are working with gloves on. 6" Needle Nose: 7" x 4" x 0.25"; 1 lb. 8" Side Cutter: 8" x 4" x 0.25"; 1 lb. 8" Linemans: 9" x 4" x 0.25"; 1 lb. 8" Slip Joint: 9" x 4" x 0.25"; 1 lb. 9" Needle Nose: 10" x 4" x 0.25"; 1 lb. Very well made. Great idea. Nice pliers, should work great in tackle box. I bought these for my son-in-law to add to his tackle box. He says they will definitely help. Handle Rite™ ergonomic pliers will make you look twice. Loop handles are a departure from standard ones, and for the better. The inspiration to create an update of needle nose, linemen, side cutter, and slip joint pliers came to Maker and fishing guide Bob Roberts after he lost one too many pairs of pliers overboard. He redesigned the typical handle for an easier to grip version that feels more comfortable and gives you better control over the job at hand. The non-slip loop is easy to maneuver, whether your hands are slippery from fishing (like Bob), if you have dexterity issues, or if you’re working with gloves on. From DIY and craft projects, to every other moment where pliers are the just-right tool, grab this pair and feel the difference.